Note: This article contains plot points of Ant-Man And The Wasp. These stingers are almost always inessential, and even those that strive to give a hint of what’s to come are disposable, the next movie taking pains to ensure the scene is utterly unnecessary. It’s no wonder people like James Mangold find them somewhat obnoxious, and indicative less of a desire to add a fun bonus to the film than to acknowledge you’re beholden to a corporate mandate to include one. (On that point, we don’t agree—they’re probably harmless at worst, no more than a nod to the “tune in next week!” serialized mentality of the era and/or comics medium from which these properties began.) But Ant-Man And The Wasp does something different. And not just different, but better: It actually provides a mini-story with real stakes, and ends on a brutal cliffhanger. The scene ties the film to the larger events of the MCU, and best of all, justifies its existence as a stand-alone scene that nonetheless adds real significance to what came before. A quick reminder: Having successfully rescued Hank Pym’s wife (and Hope’s mother) Janet Van Dyne from the quantum realm, the movie has concluded on an upbeat note. Not only has the Van Dyne family been reunited (and Scott and Hope are back together, as well), but Hank has proven his theory right: It’s now possible to travel to the quantum realm and return. So in the mid-credits stinger, Hank, Janet, and Hope set up an experiment in which Scott will travel to the realm, capture some of those particles that presumably transformed Janet into the healing-abilities person she became while stuck in there, and bring them back for further research. (With the team having shrunk the quantum tunnel to fit in the back of a van, this is a very portable experiment.) They send Scott in, he collects the particles, and they prepare to bring him back. Hope counts down to prepare him: “Five, four, three...” She never makes it to two. Cut to: Hope, Hank, and Janet crumbling away into ash, part of the 50 percent of all life in the universe that got snuffed out by Thanos at the end of Avengers: Infinity War. Well, we had lots of thoughts along the way as our story was progressing. Maybe in the back half during the chase, like showing, “Oh, there’s something on a computer or a TV screen in the background that’s showing something going on in another part of the world,” and start to seed in how it fit into the timeline. And ultimately that just felt lazy to me and like we’ve seen that before and just not very interesting. And then at some point we just started talking about all the specifics of what was going to happen to our characters and who was involved. And I think it was [Infinity War writers Christopher] Markus and [Stephen] McFeely who wrote a first initial pass of a potential tag scene. And then Chris Mckenna and Erik Sommers, our writers, took it from there and it really was deciding who was going to be involved. At one point we talked about, you know, are Bill Foster and Ava Starr present in that scene? But at a certain point it also becomes, you have to honor the percentages—that 50 percent thing that’s set up in Infinity War. It was never a mandate, but it really is something that, story-wise, we knew we wanted to get to. But also, it was this very mutual thing where we’re trying to figure out how do we deal with it but not have it completely hijack the story and the drama and the tone of this movie. So when we landed on what we did—which was this idea of bringing a certain amount of resolution to our characters and a really fun title sequence and then sort of taking a bit of a left turn with the audience after that—that really appealed to us, in that it really seemed like the proper tone for Ant-Man And The Wasp. And before we ever screened it for an audience, it felt like, “Oh, I think this could do fun things with and to an audience.” It’s been really fun to watch the movie with a crowd, for super-obvious reasons. His lengthy planning paid off. Compare this scene to nearly every other stinger since the dawn of the MCU. Each one leading up the first Avengers was a tease for the eventual arrival of... The Avengers, including Thor’s brief display of the cosmic cube. Subsequent ones nicely teased future films, or continued making lighthearted jokes. The closest any come to introducing substance are the introduction of Benicio del Toro’s Collector at the mid-credits point of Thor: The Dark World and Wanda and Pietro Maximoff’s at the end of The Winter Soldier. But both of those, again, are enjoyably inessential teases for the later films, as all three are reintroduced clearly in subsequent films. Even the ending of Infinity War, heralding the arrival of Captain Marvel to the shared universe, is just another tease. Fun, yes; weighty or affecting what came before? Hardly. And it’s possible that this scene will be replayed later. But I hope not: Part of what makes it so successful is how it becomes not just a little “stay tuned!” but adds a genuinely bleak coda to what has been overwhelmingly a lighthearted escapade of a movie. (And there’s still subtle hints about what could tie this in later to Avengers 4, for those looking closely: Janet warns Scott not to caught caught in a “time vortex.” Hmmm.) All the elements mentioned above come into play to make it the most substantive and rewarding MCU stinger in the entire history of Marvel. 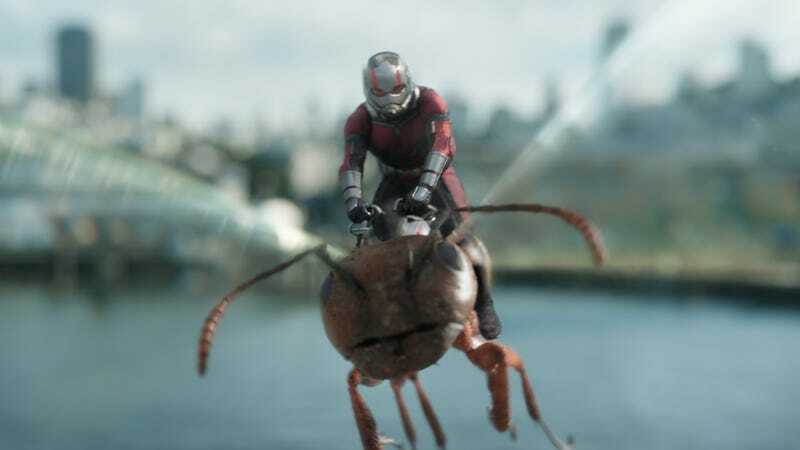 The studio should take a lesson from Ant-Man And The Wasp: If you’re going to have these mid-credits and post-credits scenes, for god’s sake, make them mean something. Give them heft and value, not just a hammy one-liner. Create a reason for them to go there, as opposed to something that could’ve just as easily either been integrated into the film or left on the cutting-room floor. You know what makes a “come back next time” feel earned? Stakes.